Luxo Villa Ooh Lala representa grande valor e excelente qualidade, com muitas surpresas extras. NÃO PAGUE MAIS E SEJA MAIS AFASTADO DE DISNEY. Famílias estendidas e os netos vão adorar esta casa. A moradia tem acesso sem chave porta da frente. Não há necessidade de ir a um escritório para pegar uma chave. O portão Comunidade é vigiado 24/7 para que você possa entrar e sair a qualquer momento. Nossa empresa de gestão Oasis cuidar da vila durante a sua estadia. Depósito de 25% com saldo de 60 dias a contar da chegada. Apenas clique e Reserve Agora em HomeAway. Nunca envie um cheque ou pague em dinheiro. O pagamento é fácil e seguro usando qualquer cartão de crédito ou débito através de Homeaway ou VRBO. Como proprietários há 17 anos, juntamente com a Sociedade Gestora, cuidamos bem dos pedidos e exigências dos nossos hóspedes. A piscina da villa muito privada e spa estão situados em um lote premium no vigiado, fechado Comunidade de Windsor Palms apenas 3 milhas da Disney. A propriedade está muito perto do Centro Comunitário e das instalações. Cada quarto da casa tem uma parede TV de tela plana e, além disso a área comum tem uma HDTV de 65 polegadas Samsung com mais de 150 canais, FREE NetFlix e conteúdo ligado web. Uma TV de 50 polegadas é na sala de jogos, de modo a não perder os eventos desportivos, enquanto jogando sinuca. Há também um leitor de DVD nesta área. 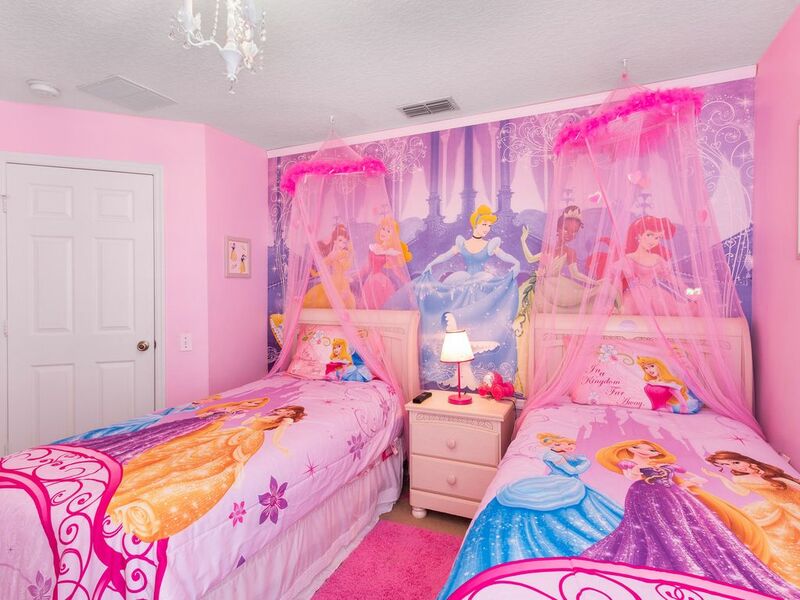 Para os mais jovens, há o Pinkest Princesa Quarto e Disney McQueen temático com duas camas individuais carros quarto. Ambos os quartos têm murais de parede completos não apenas alguns adesivos. A NOVA sala dos PIRATAS foi concluída em setembro de 2018. Equipamentos para crianças compreendem cadeira alta, dois carrinhos de passeio Jeep com cesto, carrinho rápido e leve, PAC N Play, portão para bebê, carrinhos de cama, berço metálico e colchão ALL, gratuitamente. Não há mais dores de cabeça de transporte ou custo extra para mamãe e papai. Lá fora, há uma mesa e cadeiras para o grupo mais jovem desfrutar de refeições ao ar livre. Na suíte principal há um documento codificado de segurança SAFE. NÃO FIQUE EM CASA MÉDIA COM TOPS Formica. Esta vila foi atualizado para All granito nas casas de banho e cozinha. É suas férias você merece estas instalações melhoradas e TVs de tela grande. computadores de mesa rápidos instalados em um tema de STAR WARS, bem como uma grande HDTV de 50 polegadas para manter contato com a NFL ao vivo. Ligação à Internet super rápida sem fios também é fornecida gratuitamente, juntamente com chamadas telefónicas gratuitas mãos livres dentro dos EUA / Canadá. A propriedade também beneficia de uma piscina privada / spa com corrimões especiais. Um novo queimador 2 churrasco e área de jantar ao ar livre e mesa de jantar para crianças e cadeiras estão incluídas. A cozinha está totalmente equipada. Toalhas de banho e de piscina são fornecidas. A casa está localizada dentro de uma comunidade segura fechado a poucos minutos da Disney. A comunidade Windsor Palms oferece uma casa do clube que oferece uma piscina adicional, piscina infantil, sala de jogos, loja, cinema 50 lugares, campos de ténis, centro de fitness. A segurança das crianças é importante. Há uma cerca entre a vila e a piscina que deve ser deixada para cima se houver crianças na sua festa. . Além disso ALARMES estão equipados com as portas que dão para a piscina. Trilhos de segurança são instalados na piscina e no spa. A piscina oferece um lugar perfeito para relaxar. 34 pés de comprimento e 19 pés no ponto mais largo. Muito privado, com hedges em 3 lados + O Spa é mais largo e mais rasa do que o normal. Ótimo para crianças e adultos. +. Para adicionar à piscina e spa aquecer a casa tem a opção a pedido A terra moradia está em um monte de prémios que permita mais espaço entre as casas. Você vai encontrar tudo que você precisa para manter a sua família se divertir. A melhor parte? É apenas 3. 5 milhas da Disney e perto de Universal Studios e Sea World! A comunidade Windsor Palms Resort, de propriedade privada, atende às suas necessidades! Dentro da comunidade há uma casa espaçosa clube que inclui uma olímpica salgada aquecida com base piscina, spa, piscina infantil, centro de fitness, mesa de bilhar, jogos de arcade, 50 lugares cinema livre, zona Wii, aluguer de bicicletas e até mesmo uma pequena loja de conveniência aberto até 10. 30, que também oferece traslados diários para as atrações. Se você alugar você tem os mesmos benefícios do proprietário. Espero que tenhamos o prazer de recebê-lo em nossa casa. Real Pinball Machine, máquina de Pacman real Vídeo Arcade. Kid Friendly: Grande sala de jogos. Deve alugar jogos adicionais de acordo com a faixa etária recomendada e linguagem. We loved our stay at the Ohh La La. We had two infants and a toddler and they had everything we needed to make the stay enjoyable. Our toddler loved the princess room and the duplo blocks and table. We had the pool heated and would highly recommend it- the heated spa was so nice when it was a bit cooler! The owners and the property manager were both very quick to answer any questions and resolve any small issues! The only negative was the couch in the living room! Please get a new one ASAP! Arrived at 4pm to check in, only to find a housekeeper on site who said they had not yet begun cleaning. We had a trunkful of groceries, but the house was not available until after 8 pm because there was only one set of sheets for each bed and they had to do all the laundry, leaving our family of 10 on the hook to find a restaurant for dinner at a cost of over $200. Tried to contact mgmt company at the number provided by the owners, only to be called back by a person who said she represented a new mgmt company and knew nothing about our reservation or the house. Once inside we found leftover food in the microwave, filthy and inadequate kitchen supplies, rusty knives, broken blinds, a broken faucet, a broken bed frame, cheap bedding, random threadbare towels, and a sleeper sofa that had no mattress, so we couldn’t sit on it without falling into the empty frame. The new mgmt company rep told us she needed owner approval to fix the bed and faucet, and we were three days into our 7 day rental before anything was done. Then we received a text message from the new mgmt company rep informing us that they were no longer responsible, and attached a typed notice naming yet another mgmt company, but providing no contact information. The owners may blame the change in management companies, but some of these problems had been reported before. We were never contacted by the owners, or offered compensation for the lost evening or the extra expenses incurred. The owners would do well to spend less time and money “Disney-fying” the house and concentrate on maintenance, repairs and providing adequate supplies, linens, cutlery, cooking and eating utensils, etc. Definitely not a luxury rental! We are shocked and sorry hear of this for the first time. We ALWAYS receive 4 or 5 star reviews. The complaints will be investigated in full asap. We had the opportunity to speak with the management companies. 1. There are 3 complete sets of sheets , towels and pillow cases in our home. It one set is not up to standard in any way THAT SET IS REMOVED and replaced by new sets. This was done after your review. 2. Unfortunately the first we heard of your disappointment was when we read the review. If at any time during your stay we had this information IMMEDIATE ACTION would be taken. 3. We always stay in our home for at least 3 weeks. We did so in November 2018 changing all linen and duvet covers for new ones. Installing a new lounge suite and outside furniture. So we are as shocked and saddened by your review. Sorry you did not contact us sooner. We actually tried 3 times to phone you to advise of the management change but the calls went to a voice mail. Again we are sorry and can assure you that we take immediate action to make the guest experience as FUN as possible. YOU ARE CORRECT we do spend time adding THEMES to bedrooms. We added the pirates theme and Palms theme to the home in November. Thank you in any event for letting us know of your experience. Thank you for sharing your home. Thank you so much for staying with us and your review. Great area & house super close to Disney! Our family loved staying here this week. The house is more than we needed & the pool was a favorite to relax in after long days at Disney! The couch was broken- so that needs attention and the master bedroom bed could use a pillow top mattress pad or something to make it more comfortable but otherwise the character bedrooms were a hit for our 2 toddlers! We would certainly stay here again! We are please you enjoyed the villa and speciality rooms. The bed in the main suite has a softy deluxe mattress and has been a hot favourite with most guests. We note your request. The couch was brand new in November. We will contact the company and will have it replaced immediately. Good, layout was nice and pool area was clean. The carpet was a little dirty on the stairs and upstairs, but the beds and sheets were great. The kids loved the rooms and the parents loved their space. The pool and spa were a hit also. However the spa would not heat properly for the last two days. My requests for a credit were not responded to, so I am not sure what happened with that. We would come back to this property in the future if our travel brought us to Orlando again. We checked with the pool/ spa company and the management regarding the spa heat for the last two days of your stay at our home.. The management company received a communication from you that the pool not the spa was cooler in the last two days. During the later part of the week the night time temp dropped to well below 50. This will cause a drop in water temp. That is why there is a solar blanket that rolls out to cover the pool. 3. 5 milhas da Disney Orlando. Universal Studios está a 20 minutos de carro da vila. Restaurantes e um supermercado a 2 milhas de distância.